Click the Settings link on the Gallery home page. In the left navigation, click Access Control Profiles. A list of created Access Control Profiles will be displayed. Note: You may see access control profiles in your account that you did not create. If you had configured IP restrictions, SSO or an access code for site(s) before Gallery implemented access control profiles, those settings have been saved as access control profiles when the feature was released. This is an "idle timeout". Whenever the Gallery server is hit (either through loading a page on the site or via an API call to the site) the timer is reset. This allows viewers to continually browse for longer than the specified timeout, but as soon as they go idle for longer than the timeout, they will be logged out. While a video is being watched, the Gallery server is not being accessed though, so the timeout value should be longer than your longest video. 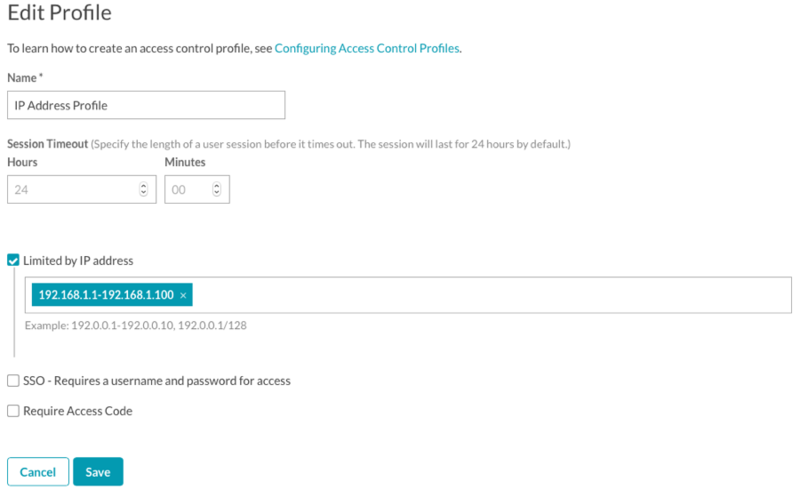 Your SSO provider must be set to either force re-authentication or to have a session timeout of less than our timeout. If it's not, we'll redirect to your SSO provider after our timeout and they will immediately issue a response that the user is logged in. Create additional Access Control Profiles as needed. To edit or delete an access control profile, click the edit ( ) or delete ( ) buttons associated with the access control profile. Once access control profiles have been created, they can be assigned to a site as part of the site properties. For information, see Controlling Access to a Portal Experience. When creating an access control profile that uses IP restriction, viewers with an IP address outside of the predefined range will receive an error when they try to access the site. Select the Limited by IP address option. Enter a range of IP addresses that can access the site. CIDR block notation is also supported. When creating an access control profile that uses SSO, site visitors will be prompted to login with valid credentials before they can access the site. Gallery supports the Security Assertion Markup Language 2.0 (SAML 2.0) standard for exchanging authentication and authorization data between security domains. Other providers using the SAML 2.0 standard will also work. Gallery uses the passport-saml library. Gallery does not support Identity Providers that do not work with this library. Note: Gallery requires SAML 2.0 for single sign-on authentication. SAML 1.1 is not supported. Note: We only support single-byte characters. Your SSO provider will require an Assertion Consumer Service URL (ACS URL). The ACS URL is listed in the SSO section of the Access Control Profiles table. The ACS URL defaults to https://auth.bcvp0rtal.com/login/callback. You can also override the ACS URL by providing your own URL. Both of these options can be used for configuring stricter SSO providers. For existing sites, http(s)://<site-root-url>/login/callback will still work but Brightcove recommends that publishers use https://auth.bcvp0rtal.com/login/callback. This endpoint takes care of forwarding SAML data to the correct site for any sites that use a path on a domain. Note: When using an IDP-initiated SSO workflow, the ACS URL specified in your SSO software should point to a Gallery site which is configured with that access control profile. In this case, the https://auth.bcvp0rtal.com/login/callback URL should not be used. If you have an export file of your SAML 2.0 metadata, click Select File to browse and select the metadata file. This will prefill the SAML 2.0 Endpoint and the X.509 Certificate fields. Enter a value for the SAML 2.0 Endpoint (HTTP). This value should be available from your SAML provider. Enter a value for the X.509 Certificate. This value should be available from your SAML provider. (Optional) Enter the SAML Issuer / Entity ID Override. Enter a value here to optionally override the SAML issuer. (Optional) Enter the ACS URL Override. Enter a value here to optionally override the ACS URL. 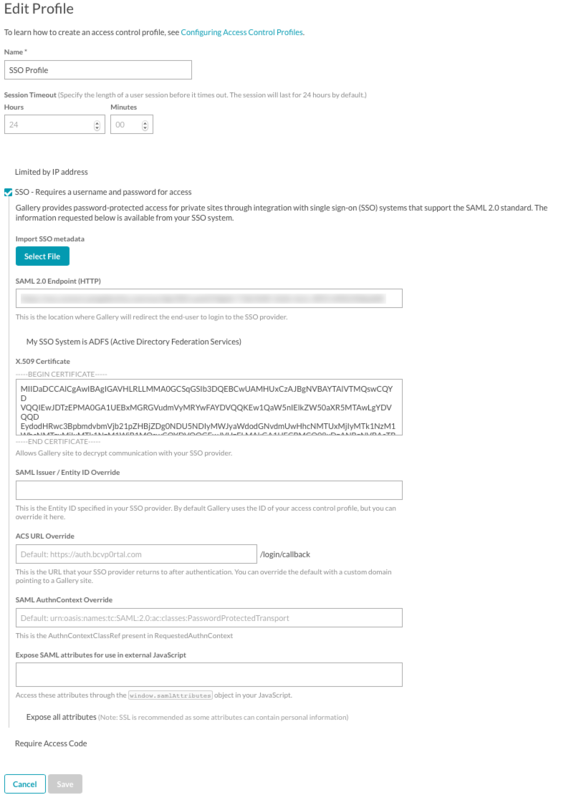 (Optional) Enter the SAML AuthnContext Override. Enter a value here to optionally override the SAML AuthnContext. When a site has an access code applied, viewers will be prompted to provide the correct access code when the access the site URL. If an incorrect access code is entered, the viewer will receive an error. Access codes are a good way to restrict access to a site while it is under construction. Access codes do not offer any site security or authentication. Select the Require Access Code option. 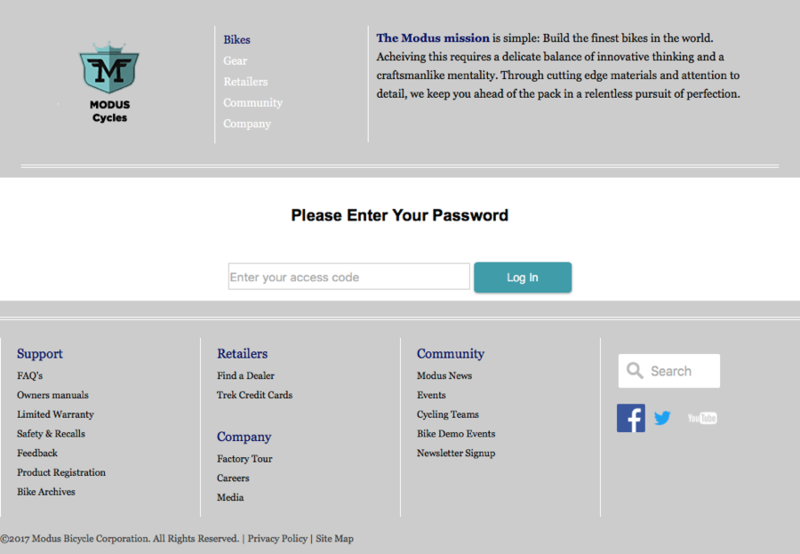 Enter the Access Code for the site. Enter the Access Code Label. The Access Code Label will appear above where the user will enter their access code. (Optional) Style the access control page. 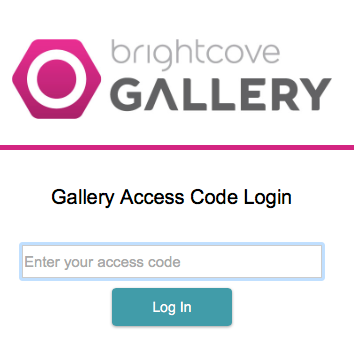 With the default styling option, a Gallery logo, the Access Code Label and an access code field will always be displayed. 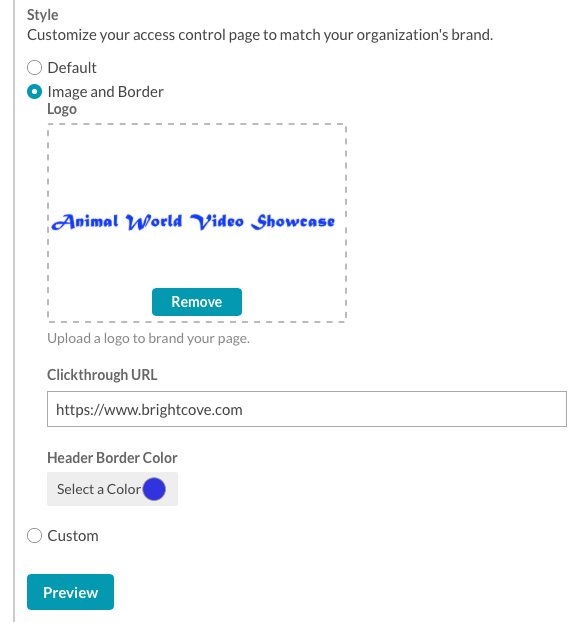 The Image & Border option allows for some basic customizations to the access control page. An example can be seen below. Drag & drop, browse, or add a link to the image to display on the access control page. Enter a Clickthrough URL. The Clickthrough URL will make the image a clickable link. Click on the color picker to select a Header Border Color. The Custom styling option allows for more advanced customizations to the access control page. An example can be seen below. 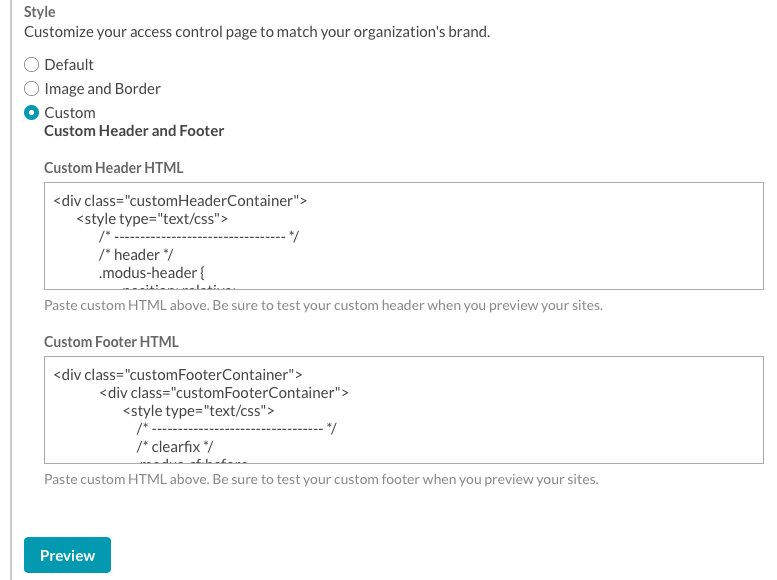 Enter custom HTML for the header and footer.